We woke up to a lot of rain this morning. 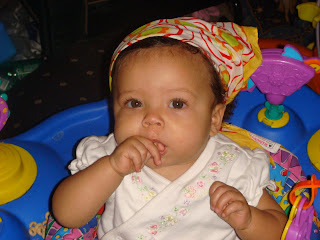 Zoe had her normal breakfast of cheerios, bananas and yogurt. 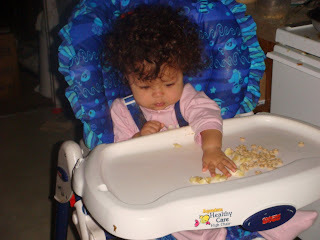 She eats them in the order of how she likes them (bananas, yogurt, then cheerios), such a funny independent girl. I wanted to make sure that she didn't get too wet getting into the car and going in to school so I fashioned her a little bonnet from a scarf. She looks so festive this morning. Happy Friday, momma doesn't have to work tomorrow!!! Beautiful! Can't wait to see you guys again!